An easy way to make sure the user enters unique values in each of the designated fields. October 28: Added support for new parameter "validate_all_fields". Will force the "master" field to be validated along with any other fields in the validation group. December 10, 2018: Fixed issue when comparing values of Checkbox fields (and other multi-input field types). * that the same number is not used for both fields. // Replace values like "1.1" with "x.1" to make it generic for comparison. Have you ever needed to collect a personal phone number and an emergency phone number? Or maybe you need to collect a minor’s email address and also their parent/guardian’s email address? It’s important for these values to be unique. You don’t want users entering the same phone number or email address for both fields. Enter your form ID for the form_id parameter. Enter each field ID that should be unique for the field_ids parameter. These field IDs should be passed as an array. For more details on available parameters, see below. On some forms you may have multiple groups of fields that should be unique (i.e. two sets of phone number fields and two sets of email fields). You can create multiple instances of this snippet to create multiple unique groups. 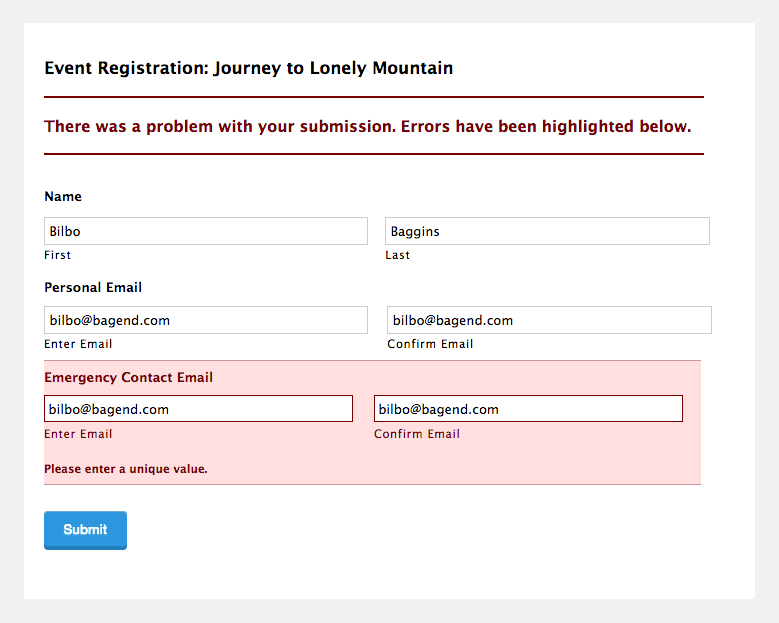 In some cases, you may want a field on the form to be completely unique from any other field on the form. Rather than specifying all field IDs, you can simply specify the single field ID that should be unique. The form ID of your form. An array of fields IDs that should be unique. The message that is displayed if the field values are not unique. Defaults to: 'Please enter a unique value.'. By default, the first field ID in the “field_ids” array is used as the “master” value and not validated. Enable this option to validate the the first field ID as well. Defaults to false. We’d love to hear what you think of this snippet. Did you run into any issues installing it? Let us know in the comments below. Could this be modified to compare the values in a list: Say something like NET and GROSS where NET must be less than or equal to GROSS. A developer could write this custom validation pretty easily. I’m not sure you would benefit much from using this snippet as a base. We don’t have an AJAX solution for this. Is there a way to make this work on a multi-part form? It doesn’t seem to work for me. I did a local test and it is working on a multi-part form for me. If you’re a Gravity Perks customer, we’ll be happy to provide additional support via the support form. This snippet would prevent the user from successfully submitting the form with the same option selected in both but it would not automatically remove or disable the the choice in the second field. Try implementing this snippet, Mostafa. Right now it looks like it does not work, but I’m not sure if this is because of ‘GF 2.4’, or because I apply it to two checkbox fields on which also the ‘Limit Checkboxes’ snippet is being applied. Hi Gert-Jan, send us a support request. Hi David is there a way to ensure list fields are unique both on the form and in all previous entries? I’m not aware of a solution for this, Tony. Thanks for this code! It works beautifully! However, I also use Zapier to do other things with my form submissions. Every since I implemented this code, my Admin Field Labels don’t make it through. Any thoughts? Almost all of the fields in the “Patient Information” section are supposed to have admin field labels. Hm, are you expecting to see the admin field labels on the frontend? I need to make sure all field selections in a form are unique. How might that work in the snippet? Unique to each other? Or unique to themselves across previously submitted values for the respective field? If the former, just include all the field IDs on your form in the field_ids parameter. If the latter, enable No Duplicates via the field settings for each field. I am using this code as per ur instruction but Validation message not changing. From the above url: Email id is unique but custom validation message not working. Hi Haridasan, I’ve just tested and this snippet is still working for me locally. Do you have a URL to the form and can you share a snippi of your snippet configuration? There will be a form. It shows “This field requires a unique entry and ‘haridasansocialbeat@gmail.com’ has already been used”. which is Default Message. I want to customize it. The form id is 1 and the field id is 2. Not working please help. Hi Haridasan, this snippet does not let you customize the no duplicates error message. 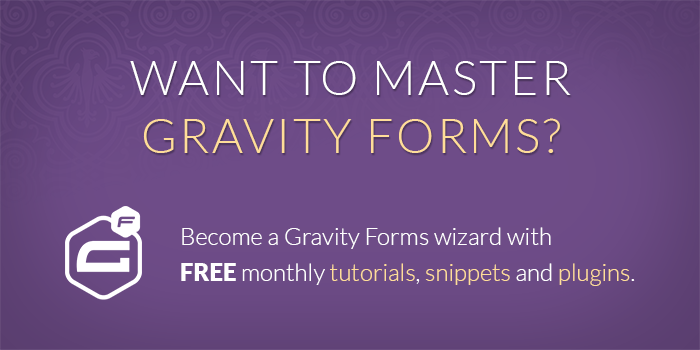 I believe Gravity Forms support will be able to help you with this. Can you please help me with this? Thank you! Hi Alex, I’d love to add support for this functionality to this snippet. If you are interested in commissioning this functionality, get in touch. Not sure if I am looking in the right place…. but. Is there a way to make the Advanced “Address” Field unique? This is actually possible with the Better Limit Submission snippet. See the “field_group” option under the “limit_by” parameter. This is exactly what I needed! Thank you so much for all of the great work that you do, and all that you share freely. I am hoping to purchase your Gravity Perks plugin in the next few days! I have used this code to compare two fields but I have a problem wtih the form_id which seems to not be recognized. It seems to be applied in all forms and not only the one selected. 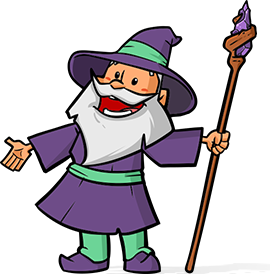 I have changed form on my website test because the code caused bad issues at all other forms on my website. Awesome, Valerie! I’m glad you were able to figure this out. Thanks for sharing your solution.